You dont have to go far to replace the traffic, summer crowds, or the relentless commercialization of Traverse City with woods and a bit of quiet. A short drive but a world away - from northwest Michigans largest urban area is the Sand Lakes Quiet Area, five small lakes surrounded by rolling hills of oak and pine. This 2,800-acre tract does not posses the stunning scenery of nearby Sleeping Bear Dunes but it is quiet, thanks to a ban on motorized activity. It is also a great overnight escape from the city as Sand Lake No. 1 features walk-in campsites and vault toilets. You don’t have to go far to replace the traffic, summer crowds, or the relentless commercialization of Traverse City with woods and a bit of quiet. A short drive – but a world away - from northwest Michigan’s largest urban area is the Sand Lakes Quiet Area, five small lakes surrounded by rolling hills of oak and pine. This 2,800-acre tract does not posses the stunning scenery of nearby Sleeping Bear Dunes but it is quiet, thanks to a ban on motorized activity. It is also a great overnight escape from the city as Sand Lake No. 1 features walk-in campsites and vault toilets. 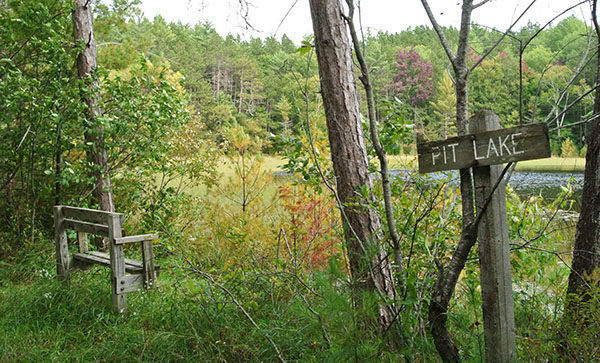 Part of the Pere Marquette State Forest, Sand Lakes was designated a non-motorized “quiet area” in 1973. There are actually 12 lakes and ponds within the tract that can be accessed by a system of maintained trails as well as old fire lanes that are unmarked and slowly becoming lost in the undergrowth. The five Sand Lakes are marl lakes, glaciated-created body of waters that contain a high percentage of calcium carbonate in the sediments at the bottom, the reason some of them feature an unusual greenish color. Several of the lakes are more than 40 feet deep and Sand Lake No. 1 is managed for rainbow trout while Sand Lake No. 2 has brook trout. The tract’s maintained trails form a 6-mile loop, with eight trailheads providing access from four different roads and the Guernsey Lakes State Forest Campground. The trails are wide, well-marked with locator maps at the junctions, and generally easy to follow. The posts are numbered in a clockwise direction, with Post No. 1 located at the Broomhead Road Trailhead parking area. From this trailhead it’s only a 1.1-mile trek to the walk-in sites on Sand Lake No. 1. For an even shorter route to the campsites begin at post No. 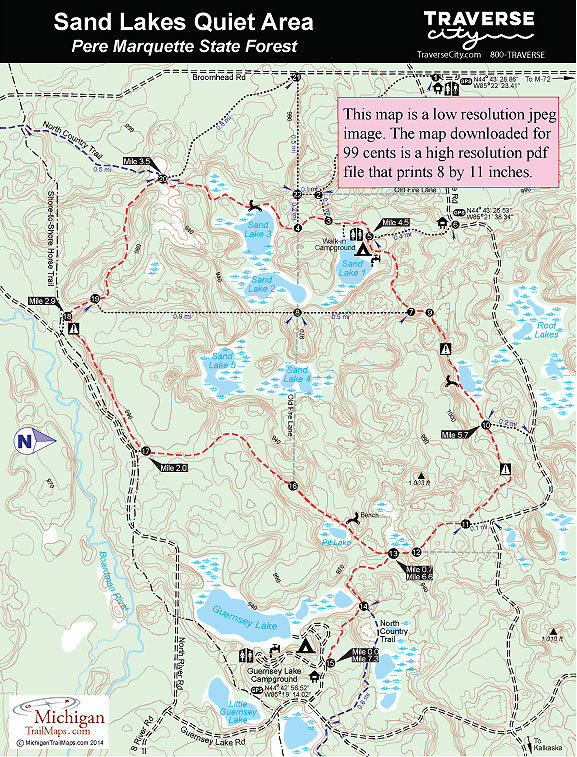 6, a trailhead located on Sand Lake Road, and you’ll be pitching your tent in less than a half mile. 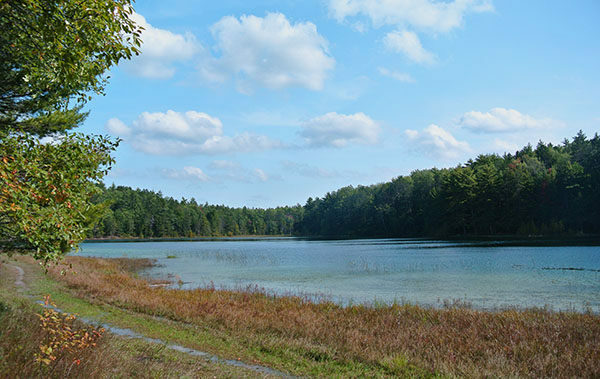 This description begins at the trailhead in Guernsey Lakes State Forest Campground, the best place to start if you want to turn Sand Lakes into a pleasant overnight adventure that includes the entire loop. You begin with a 4.5-mile walk the first day and then conclude the outing with an easy 2.9-mile hike the second day to return to the rustic campground. 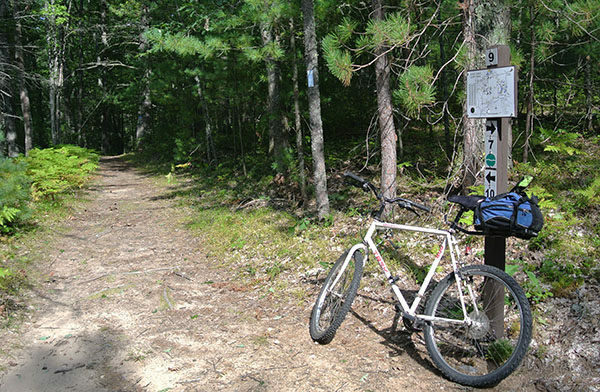 The North Country Trail (NCT) utilizes 3.5 miles of the Sand Lakes trail which resulted in many of the trail posts being re-numbered in 2007. Also keep in mind that mountain biking is allowed on the trails and the area does attract a fair number of off-road cyclists, mostly after work or on the weekends. But you’ll find that most mountain bikers arrive at Sand Lakes looking for a leisurely ride to enjoy the scenery. Hard-core mountain bikers head over to the much more challenging VASA Single Track that is only 2 miles away. In the winter Sand Lakes is an entirely different experience see Sand Lakes - Winter Trails for a map and description. On the entrance drive to the campground is a parking area for hikers with post No. 15 located across the dirt road from it. The spur to post No. 13 on the main loop begins as a level path through a stand of red pine before descending to post No. 14, marking a junction with the North Country Trail. To the east (right) the NCT winds past several small ponds, one visible from the junction, on its way to Kalkaska. You head west (left) where the trail follows an old logging road around what use to be the northern inlet of Guernsey Lake. In 0.7 mile you gently descend to post No. 13. Head south (left). The trail now becomes a wide path heading south through the trees, resembling a raised bed of an old logging railroad and within a quarter mile arrives at a bench overlooking Pit Lake, a scenic spot. From the lake, the trail continues in a growth of pine and in a little over a mile from the campground reaches post No. 16, marking a junction with an old fire lane that heads west to Sand Lake No. 4, and at Mile 2 arrives at post No. 17 within view of the yellow trailhead gate just off Guernsey Lake Road. At post No. 17 the loop swings west (right) and to follow a low ridge. You skirt the dirt road from above, though you rarely see it, then descend sharply to post No. 18 at Mile 2.9. Head north (right) to quickly reach post No. 19 where the trail returns to following an old logging road that reaches Post No. 20 at Mile 3.5. This is where the North Country Trail merges with the Sand Lakes trail system from Muncie Lakes Pathway to the west. Also at this junction is a path that heads northwest (left) to reach a trailhead on Broomhead Road in 0.7 mile. The main loop swings to the north (right) for post No. 4 and within a half mile arrives at a bench overlooking Sand Lake No. 3, a clear body of water that can be fished for bass and panfish. The trail skirts the lake for a good view of it and then arrives at post No. 4 at Mile 4.2. Continue north (right) at the junction to reach post No. 3 and then post No. 5 in a half mile. The walk-in campground is a short walk towards the lake just beyond post No 5. It's a shady area with enough space for a half-dozen tents. The lake is oblong shaped, shallow in most places, and hikers are often surprise at how green it is at times. Post No. 5 marks the junction of the 0.4-mile spur to the trailhead on Sand Lake Road while the main loop heads east into more rolling terrain to each to reach post No. 7 in a half mile and post No. 9 at Mile 5.1. Here the main loop swings to the east (right) for the most scenic stretch of the day. In the next half mile you skirt a small, unnamed lake where on a still day its surface is a perfect mirror for the shoreline trees. A bench has been conveniently located here to savor such a moment. The trail then skirts the west end of the lake before ascending to post No. 10. The main loop continues east and weaves its way through the gently rolling terrain, forested in hardwoods and pines. You reach post No. 11 at Mile 6.3 and then follow the crest of a low ridge before emerging at another fire lane, a junction marked by post No. 12. Head south (right) on the fire lane and post No 13 quickly pops up at Mile 6.7. just 0.7 mile from your vehicle at the state forest campground. 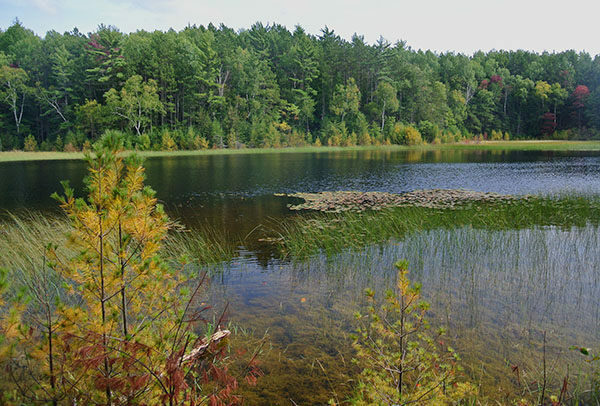 Small lakes abound in this part of the Pere Marquette State Forest especially around Guernsey Lake State Forest Campground. Surrounding the entrance of the campground are Little Guernsey Lakes, three small bodies of water within view of Guernsey Lake Road. The campground features 30 sites on a pair of loops, all of them on a bluff above the Guernsey Lake with stairways leading down to the water. Facilities include tables and fire rings as well as a hand pump for water, and vault toilets. The walk-in campsites on the edge of Sand Lake No. 1 feature a pair of vault toilets but the backcountry water pump that was once located here has been removed. Backpackers will need a filter if spending the night camping on the lake. Sand Lakes Quiet Area is used year-round. A daily vehicle entry permit or an annual state park pass is required to park at the trailheads. There is no fee for backcountry camping but there is a nightly fee for Guernsey Lake State Forest Campground. From Kalkaska turn west on Island Lake Road just north of the McDonalds on US-131. Within 5.5 miles you pass Island Lake then veer to the left on the dirt road and follow it 1.5 miles to Guernsey Lake Road (also known as Campground Road). Although Guernsey Lake Road is not posted, there is a state forest campground symbol here. Turn south (left) and the campground entrance is reached in a mile. 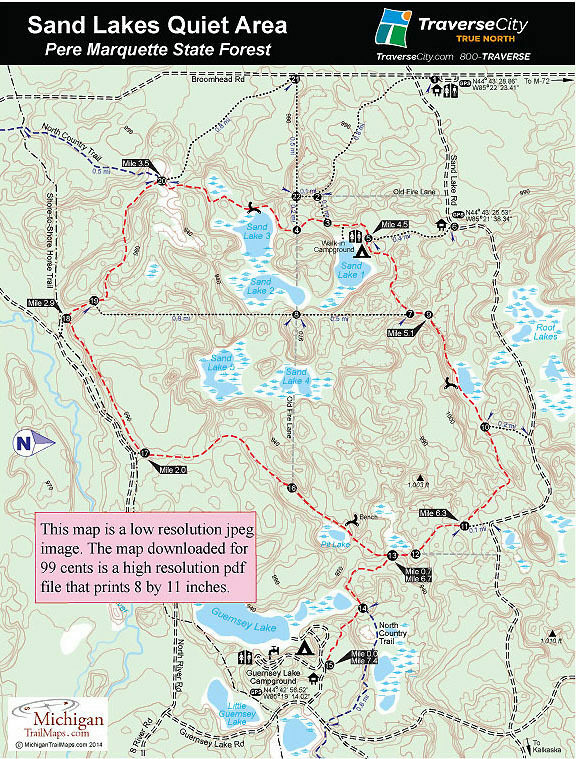 To reach the trailhead from Traverse City, take US-31 and then M-72 23 miles east to Broomhead Road. Turn south (right) here, swinging east and then south again and within 4 miles turn left on Sand Lake Road. Turn right on Guernsey Lake Road to the state forest campground where there is a trailhead parking area. Contact the DNR Traverse City Field Office at (231) 922-5280. For travel information contact Traverse City Tourism (800-872-8377; www.traversecity.com).